Everyone a Reader is supported by the San Diego County Office of Education and run through our PTA. The program provides blossoming readers in grades one through three a little extra support to help them flourish. Del Mar Heights benefits from having several retirees in the community who loyally serve in this program. Each child in the program reads with a reading buddy two to three times a week. Everyone a Reader is a great way to work with children one-on-one and be an advocate for readers that need a little extra TLC. Many tutors volunteer for this program for more than one year because they enjoy sharing their love of reading with our children. We are always looking for new tutors! This program connects students' experience in our main garden with local chefs who work with our students to harvest, prepare and cook food from our crops. Students will have a genuine farm-to-table culinary experience. Our flourishing garden programs are providing students an opportunity to learn a variety of concepts while developing a passion for the outdoors. Programs include the popular lunchtime garden club, our Farm-to-Table program, as well as a large variety of classroom and community service projects. Students, teachers, and parents work closely with our fantastic garden coordinator, Stephanie Murphy, to come up with new and inventive ways to cover curriculum. In our continuing workshop series, topics are determined by current trends and the interests of our parents. The PTA provides childcare in order to help make it easier for parents to attend. These monthly evening events enable our kids and their parents to explore various science topics in a fun and interactive environment. See more here. In a program unique to Del Mar Heights, UCSD athletes inspire children to develop their physical fitness. Created in 2004, student athletes arrive a the Del Mar Heights campus at 7:15am to play games and sports, enjoy activities, supervise, and mentor elementary students until the school day starts at 8:00am. Learn more HERE from our write up in the UCSD magazine. Understanding Differences is a unique, award winning disability awareness program created and developed at Del Mar Heights in 2005. This school-wide program teaches students empathy and understanding through participation in science lessons, simulation exercises, and interactions with guest speakers. Each year, throughout January, the Del Mar Heights community participates in a variety of activities designed to foster tolerance. Understanding Differences is supported by the staff and PTA, over 75 parent volunteers, UCSD undergraduate psychology volunteers as well as by multiple community volunteers with disabilities. ​This program was honored by the North Coastal Council PTA with a Program Award of Excellence and has been awarded the California School Boards Association Golden Bell Award. Every Friday at lunch (11:30-12:30), students in grades 1-6 have the opportunity to learn something new in garden club! After a unique and interesting lesson, students work in the garden on a variety of tasks, and then are rewarded with a treat at our tasting table. Parents, grandparents, and community members are encouraged to attend. No need to notify us ahead of time- just show up! ​Robotics Club - Chair: ﻿Jared Brzenski﻿, We also need an ADMIN! 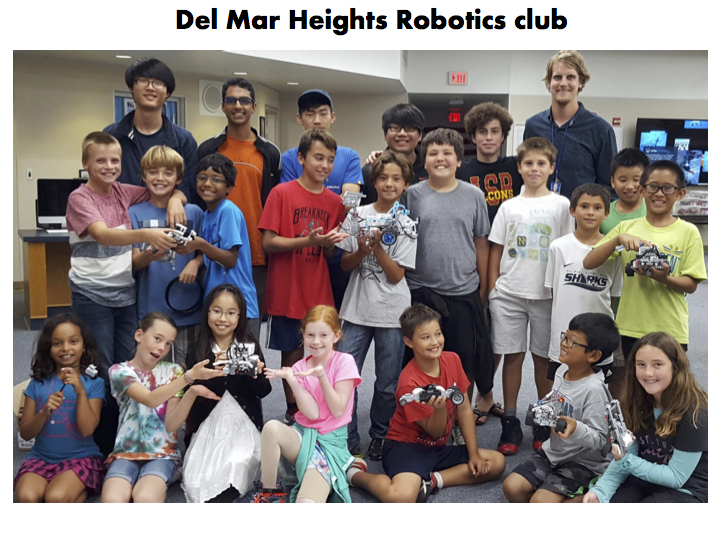 A parent-run club using a variety of robots and computer software. We have several programs available, including Junior Robotics, Youth Robotics, and First Lego League. For more information, click here. Open to students in grades 1-6. An after-school club where students learn how to do funny voices, create characters, plan fun improv games, and make quick comebacks to other kids' jokes. This club is perfect for showoffs, class clowns, actresses/actors, writers, and anyone else who wants to learn. Bonus points if you can make other kids laugh so hard that milk spurts out of their noses! The Cultural Heights program is an initiative to increase respect, awareness and enjoyment of the multicultural world we live in. Each year focuses on a new culture represented in our school. Cultural Heights supports our STEAM+ curriculum by exposing students to programs and performances across cultures and genres. Choir participants are led by a San Diego Children's Choir trained music director in singing fun and engaging music from all over the world and from all different time periods. Singers participate in an informal concert for family and friends at the end of the 12-week session. Weekly after-school choir rehearsals include an introduction to music reading and healthy vocal technique. Offered to Kinder-2nd grade. Click here for more information. This program is funded partially by participation fees. This new program is for our talented young singer/dancers. Students learn HOW to sing with good breath support, HOW to learn parts, and HOW to achieve all this while dancing. Program includes a weekly class and informal performance at the end of the session. Glee Club will be taught by professionals from Villa Musica. Offered to 2nd-6th grade. Click here for more information. ​This program is funded partially by participation fees. Students submit original works of art in a variety of mediums. All Heights families are encouraged to attend the evening Art Show in which submissions are displayed. ​This program helps students develop imagination and build self-esteem through performing arts. The program culminates in a full-scale production put on entirely by students. Click here for information on this year's production. Students from every grade level showcase their talents, with performances including dance, music, martial arts, and much more! Get your child together with some friends and put on an act, or let your child showcase a special talent. All students are invited to participate. ​Funding covers a variety of art programs, as well as the art supplies needed to support those programs. ​The PTA funds assemblies across the grade levels that are identified and organized by teachers and school staff. This includes Imagination Machine, California Weekly Explorer, The SD Museum of Natural History, Play-it-Safe, and more. ​The PTA provides classroom grants to each teacher and staff member to fund instructional needs, often those previously funded by the state. ​The PTA provides grants to teachers to supplement common core curriculum with necessary materials not provided by the district or state. ​The PTA funds extra early morning supervision so that parents may drop off students in grades 1-6 as early as 7:15 a.m.
​Funding covers 100% of our library materials with a new focus on building out our e-books library with unlimited access e-books. ​Funding to purchase sports equipment and supplies to support our award winning Physical Education program with Mr. Phillip. ​Funding to support our innovation center, tinker lab, and other school needs that support every student. Funding covers 100% of all science materials used by our students in their science classes with STEAM+ teacher, Ms. Minarik. Funding covers laptops, tablets, Apple TVs, coding robots, innovation lab materials, white board tables, Osmo equipment, 3D printers, technology software, and more!